Back in August we wrote about a neat service called fflick that looked to harness Twitter to power a movie sentiment and recommendation engine, with an added dash of colorful style. Now the service is getting two big thumbs up from Google: the search giant is in the process of acquiring the company for a price-tag of around $10 million (we expect the deal to close later this week). At this point it’s unclear if Google intends to keep fflick alive, or if this is primarily about the startup’s talent and the sentiment analysis engine that drives its recommendations. The service is pretty straightfoward: you sign in with your Twitter account and are shown a list of top-ranking movies. Next to each film is a set of relevant tweets from the people you follow. 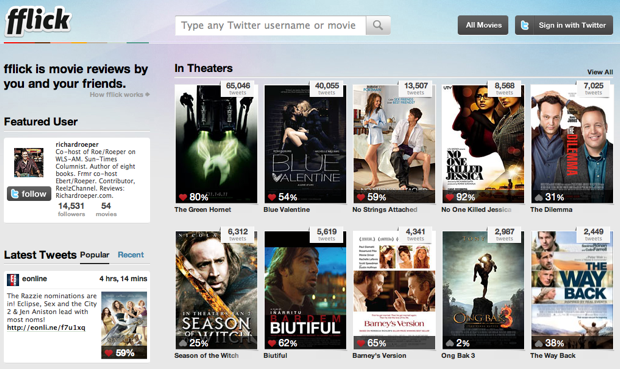 You can also choose to browse by sentiment, viewing a stream of positive or negative tweets about each movie. fflick was founded by four former Digg employees. When the company launched last summer it said that movies were only its first vertical, and that it would expand to use its sentiment technology elsewhere down the line.